It's hard to capture exactly what OmniGraffle 7 is. Sure, it's a vector drawing and diagraming tool, but the power of OmniGraffle lies as much in the flexibility of its tools as anything else. 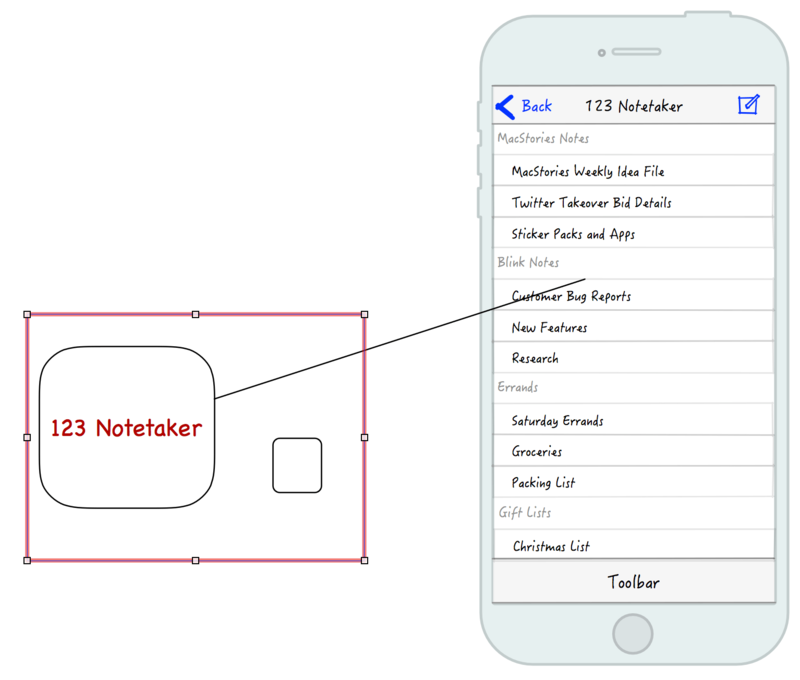 By giving users the ability to tweak virtually any property of a shape, line, or other graphic element on its canvas, OmniGraffle works equally well for prototyping an iPhone app as it does for laying out an addition to your house or creating a corporate organization chart. With Version 7 of OmniGraffle, The Omni Group plays to its strengths, further extending the power, adaptability, and ease of use of those tools in what adds up to an outstanding update. OmniGraffle comes in Standard and Pro versions with the Pro version adding several advanced tools. It’s worth noting at the outset that the difference between the Standard and Pro versions of OmniGraffle is not the utility of the Standard version’s toolset. The Standard version has a robust set of tools that stand up on their own. The Pro version adds different advanced tools that you may or may not want depending on your needs. If you’re not sure which is best for you, start with the Standard edition, because you can always upgrade later. 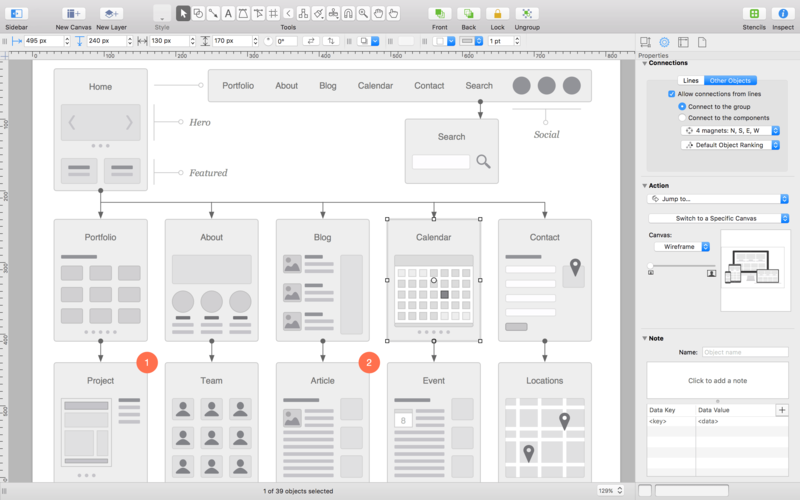 Diagramming the flow of a website with OmniGraffle. Work in OmniGraffle happens on the canvas, where you place shapes, lines and other graphic elements. With version 7, OmniGraffle supports an infinitely expandable canvas. This is a welcome change available in both versions of the app. When I start a new document in any graphics app and am asked to pick a size, it’s often no more than an educated guess at what my needs might be. Projects evolve, which necessarily means space needs change. With a canvas that can expand in all directions, OmniGraffle makes it easy to get started without having to resize the canvas later and shift your work around to fit new canvas boundaries. OmniGraffle 7 plays better with other graphics apps. The app previously added support for exporting your work as an SVG file, but now, you can also import SVG graphics, which means OmniGraffle can become part of whole new workflows. If you have art assets created in other apps like Sketch, Acorn, or any other app that can export SVGs, OmniGraffle can now join your workflow as a destination app instead of just a starting point. This is a big deal if you have other apps that have tools that you are more familiar with or prefer for asset creation, but want to bring artwork created with them into OmniGraffle to leverage features that are unique to it. Pro users can also take advantage of artboards in OmniGraffle 7. With the Artboard tool, you can draw any shape supported by OmniGraffle around objects on your canvas the same way you would draw shapes with the shapes tool. The objects within the bounds of your artboard are part of an artboard layer and can be moved as a group by dragging the artboard instead of selecting each object on the canvas that you want to move. Artboards can also be used as a way to define the objects in a region for later export. An artboard outlined in red using the Artboard Tool. 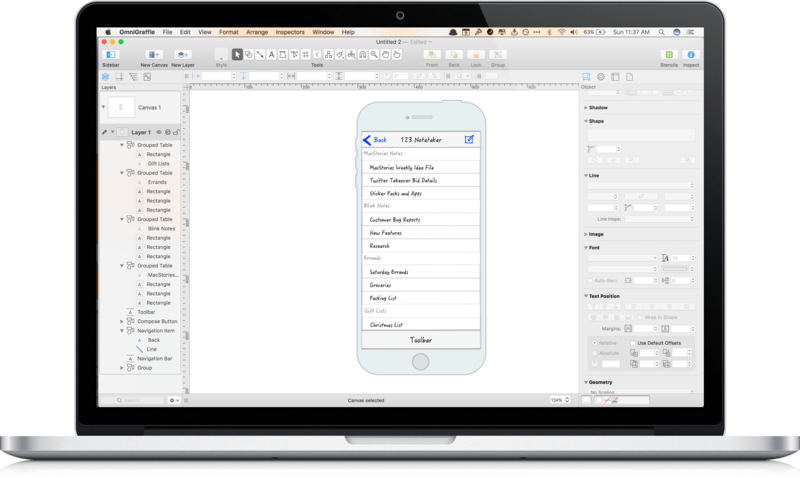 Customization is a big part of what makes OmniGraffle so powerful. Just take a look at all of the properties that can be tweaked in the Inspector for any object. Version 7 gives Pro users even more control by letting them convert text and strokes to shapes. Turning text into shapes gives users access to all the properties that can be modified for shapes, like adding gradients and strokes or editing the characters themselves using the Point Editor for moving any Bézier point in a shape. The same options are available when strokes are converted to shapes. 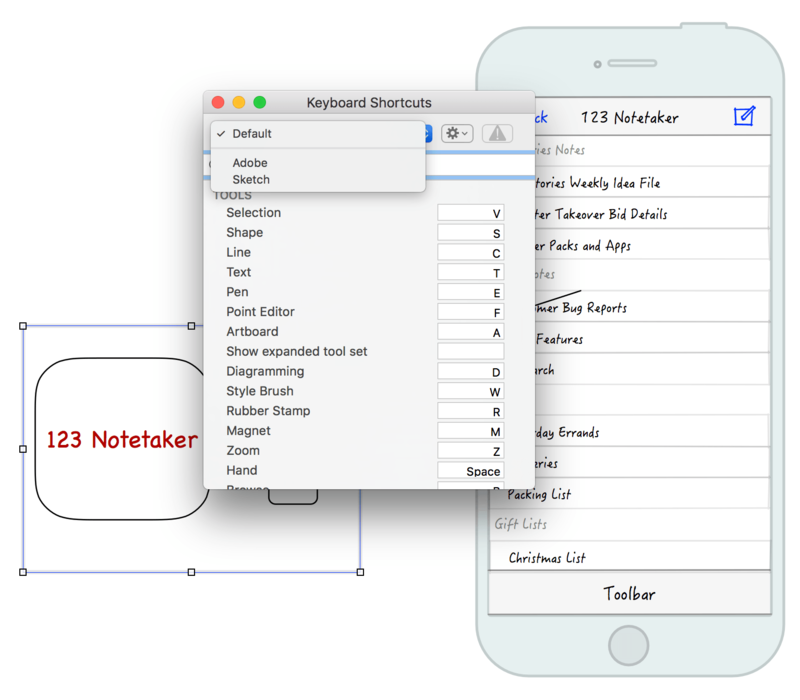 Keyboard shortcuts are an important feature for working fast in any pro-level tool. OmniGraffle 7 lets users define their own keyboard shortcuts for any menu item or set shortcut configurations that are consistent with Adobe tools or Sketch. In addition, Pro users can share their keyboard shortcut sets with others. OmniGraffle keyboard shortcuts are highly customizable. OmniGraffle 7 has made many other little changes to better organize tools and make working in the app easier in general. Two areas where this is most evident are the sidebar to the left of the canvas and the export panel. The sidebar combines all of your layers, groups, canvases, objects, and other screen elements and makes them available in four different views (layers, guides, outline, and selection). The export panel includes a bar along the top for picking the export format and several options that can be set, including exporting in a variety of sizes, which is great for something like iOS art assets, which often need to be created in multiple resolutions. OmniGraffle has been around for a long time and has a feature set so robust that the manual for the last version is a 300 page iBook. Often apps with such a long history and feature list feel bloated and out of date. OmniGraffle 7 is a strong statement by The Omni Group that it doesn’t intend to let that happen. There will always be more work to be done, but with one significant update, Omni has sent a clear message that OmniGraffle is a serious, modern tool for getting real work done and can fit and work effectively side-by-side with other vector drawing tools on the market. Whether you are an existing OmniGraffle user or have never tried it, but do work that requires you to express ideas visually, OmniGraffle 7 is an update worth taking a closer look at. Omnigraffle 7 is available on the Mac App Store as a 14-day free trial, after which the Standard version can be purchased for $99.99 as an In-App Purchase; the Pro version is also available as an In-App Purchase for an additional $99.99. Both versions are also available on The Omni Group’s website, where you can also find information about upgrade pricing.